Yesterday, that sub-tropical-but-not storm from the Bahamas arrived off the South Carolina coast. While at work downtown, I watched the squall lines come ashore, grateful I was inside. It was a deluge! Thankfully, I live further inland, and my garden received only a nice steady rain. However, the storm didn’t bring warm air with it. It was actually a little “raw,” in the low 60s with a stiff breeze and rain. I needed something warm to fill my belly when I got home from work, and I wanted to use my recent harvest of chard and peas. So, my Garden Wilson and I got creative together in the kitchen, and we whipped up this stir fry that tasted so wonderful, I had to share it with you. NOTE: Feel free to substitute other veggies from your garden – spinach, daikon radishes, celery. 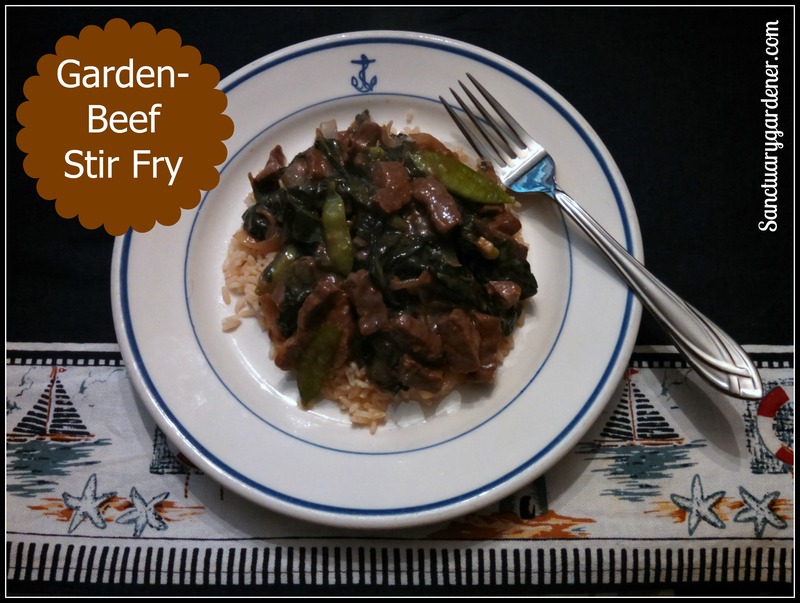 The idea is adding the garden to your beef stir fry. 1. In a large bowl, mix the beer, 1 Tbsp vegetable oil, soy sauce, red wine vinegar, and crushed dried chili peppers to make a marinade. Add the sliced steak and let marinate at room temperature for about 15 minutes. 2. Saute the onions and garlic in oil on medium heat (in a large frying pan or wok) until the onions are soft. 3. Remove the onions and garlic from the pan and put in a small bowl for later. Add the beef to the pan (reserving the marinade for later), and saute on medium heat until the meat is medium-well done. 4. Meanwhile, add the flour to the marinade and mix very well. Let sit until needed. 5. When the meat is cooked, remove the meat from the pan and put into the bowl with the marinade-flour mixture. Mix well. 6. Add snow peas to the pan (you should have a beefy liquid left in the pan). Saute on medium heat until the pea pods begin to soften. Add the cooked onions and chard and continue to saute until the chard begins to wilt. 7. Add the beef and marinade to the pan and mix well. Continue to saute on medium heat, stirring constantly, until the marinade thickens into a sauce. ~ If you try my recipe, please comment below how you liked it. Let me know if you made any modifications using what’s in YOUR garden. I may like to try it myself. Sounds delicious! I wish I cooked more, but I prefer to leave that to my husband. It’s wonderful he cooks! Well, pass on the recipe to him. ;). We were so pleased at how well it turned out. Marvelous flavor. I think using Guiness put it over the top.